Here in Southern Indiana, the first full week of October is Fall Festival – it’s a street festival that is touted as the second largest street festival in the United States (second only to Mardi Gras). It has rides and like five blocks of food booths with about any kind of food you can possibly think of (and a lot of foods you probably never would have thought of). 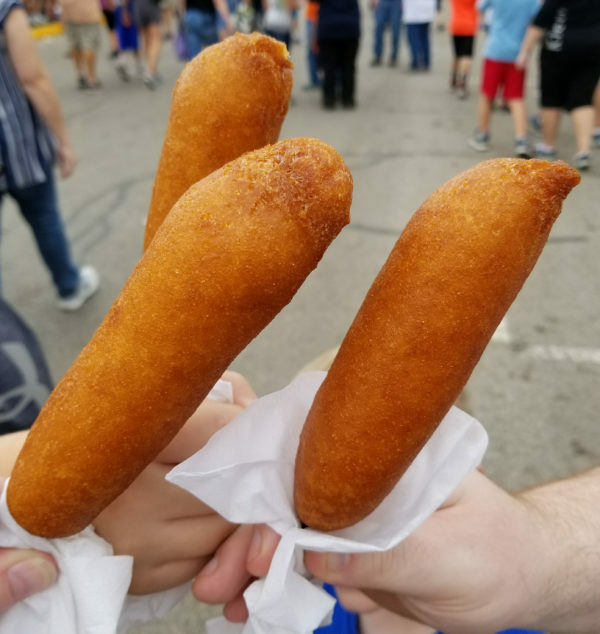 One of the staple foods at the Fall Festival, and at many fairs across the U.S. is Pronto Pups. Pronto Pups are different from corn dogs because of the batter, which is made out of a blend of several different flours to create the widely popular taste. These tasty treats would also make a GREAT entree for a family game night – hence this recipe for our Family Game episode! If you make Pronto Pups at home, we’d love to see pictures of your family and friends enjoying them! Post them on social media and tag us! In a shallow dish, combine pancake a cornmeal mixes, milk and egg. Mix well and set aside. Place hot dogs lengthwise on each skewer. Roll hot dogs in pancake mixture, coating completely. Place coated hot dogs in skillet (or in deep fryer) and cook for 1-2 minutes (or until coating is a golden brown color).